According to a new Nielsen Survey, brand sponsorships and brand websites are among the most trusted forms of advertiser-initiated marketing. 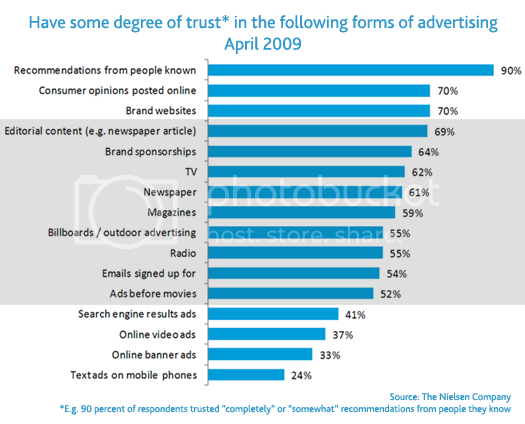 However, consumer generated media, such as recommendations from friends and consumer opinions posted online still have the highest degree of trust in all forms of media (advertising and consumer-led). The survey revealed that for brand sponsorships, "trust in advertising" has grown from 49% to 64% in the two years since the last study. This increase is greater than any other form of media (tv, radio, online banner ads, text message, search). We see that all forms of advertiser-led advertising, except ads in newspapers, have also experienced increases in levels of trust and it’s possible that the CGM revolution has forced advertisers to use a more realistic form of messaging that is grounded in the experience of consumers rather than the lofty ideals of the advertisers. And what happens when clever marketers combine both brand sponsorships and brand websites? Well, Saxo Bank is about to find out with their new Tour de France site. For more information on Nielsen's latest study, click here.